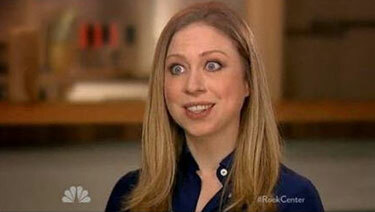 2 Feedbacks on "Vanity Fair on Chelsea Clinton"
I’m going to give her a break. If you grew up with those parents, you’d be pretty screwed up, too. I once read a humorous science fiction novel that referred to all aliens as BEMs. Bug Eyed Monsters. Poor Chelsea is a BEM. Her mother is a Martian and her father comes from some strange galaxy far, far away and long, long ago. Call the men in black.